Want the complete story about the latest womens fashion jewelry trends? Just think larger-than-life and you've nailed the concept that's overtaken the costume jewelry world. The idea seems to be that more is more and that size matters. The bigger the better. Go for the garish, embrace the bold, buy bohemian. You can even get reckless and wear a chunky rhinestone necklace over a tee on Saturday afternoon and let the same piece embellish your little black dress later in the evening. Match or mis-match . . . what the heck! Because why would you want to settle for just one necklace when two or three layered on your chest will make an even bigger statement! Sometimes the right necklace is the only accessory you'll need because it can transform the most minimal wardrobe into a spectacular presentation. 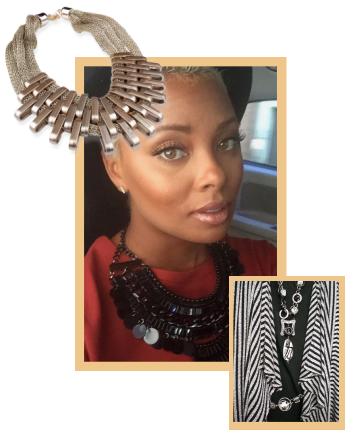 That's the thing about a statement necklace...it speaks for itself. Of course you can pair it with a chunky bracelet and long dangling earrings if you want...but you can also just leave it alone and let it do its thing. If your ears feel naked then add a pair of tiny gold or silver studs to make them feel better. You might think that you have no occasion to wear such a bold accessory but the vogue is to wear them with anything. I'm seeing lots of large bib necklaces...whether rhinestone, resin cabochons or felt-backed seed bead constructions...tucked under a collared shirt worn to the office. Add a punch of red lipstick and a pair of high, high heels and you're off to a party after work. What would grandma think of that? You've probably got dozens of cute little earrings on stand-by . . . delicate gold and silver posts, maybe some short subtle drops. Put them aside for awhile because they're not the in thing this year. Just don't throw them out because... they'll eventually come back in style. Now's the time to jump on the women's fashion jewelry bandwagon and shop this year's trends. Splurge on a few pairs of big, bold bohemian earrings and wear them with aplomb. Try a long linear pair that brush your shoulders...or a couple of huge but light weight metal posts. Flaunt them in front of your mother, your Latin teacher and maybe an ex-boyfriend from waaaaaaaay back. Read what is new with bracelets, earrings and necklaces.